What to Do if your Dog is Choking? Home / Articles / Pets / Ask the Pet Expert / What to Do if your Dog is Choking? When the unexpected happens it´s time to think fast. If your dog began choking, would you know what to do? When a person chokes, someone must perform the Heimlich maneuver to dislodge any object blocking the airway. In the case of a choking dog, the process is surprisingly similar. When a dog is choking, you can do a modification of the Heimlich maneuver. Below are some tips on performing this lifesaving process. Hopefully you will never have to use it, but it´s best to be prepared. 5. Check the mouth Before administering any first aid, make absolutely certain your pet is actually choking. Many people confuse difficulty breathing with choking. If you witness your pet ingesting an item and then immediately begin pawing at the face, the throat, acting frantic, trying to cough and having difficulty breathing, only then should the Heimlich maneuver be considered. If your pet is not really choking, the Heimlich can cause serious injury. After determining that your pet is choking, remove any item that may be constricting the neck. Examine inside the mouth and remove any foreign object you see. Do not blindly place your hand down your pet´s throat and pull any object you feel. Dogs have small bones that support the base of their tongues. Owners probing the throat for a foreign object have mistaken these for chicken bones. Do not attempt to remove an object unless you can see and identify it. • Grasp the animal around the waist so that the rear is nearest to you, similar to a bear hug. • Place a fist just behind the ribs. • Compress the abdomen several times (usually 3-5 times) with quick pushes. • Check the mouth to see if the foreign object has been removed. • This maneuver can be repeated one to two times but if not successful on the first attempt, make arrangements to immediately take your pet to the nearest veterinary hospital. 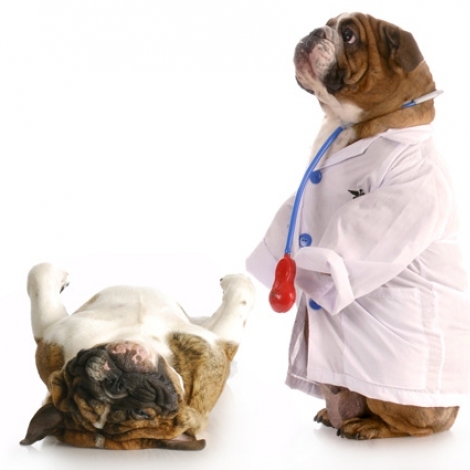 Even if you are successful in removing a foreign object, veterinary examination is recommended. Internal injury could have occurred that you may not realize. We hope you and your dog never experience such a scary incident, but if you do, you should be prepared. Information like this can save their life. We recommend post ing it somewhere that´s easy to find. You might even want a copy of it for your wallet or purse. This article is also posted on our Facebook page as well. For more information come to the Paw Depot and speak to our pet experts. Pet Diet & Nutritional advice is always FREE and we have large variety of quality pet products to help you maintain a healthy and happy pet.